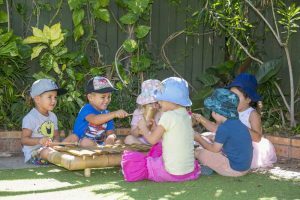 Our Parent Toddler Program provides an opportunity for children and their parents to come together in a specially prepared environment suited to the developmental needs of young children. This nurturing environment with specially designed materials and equipment is calm, ordered and enticing to children to explore and assist them in realising their full potential. The focus of our program is to help children experience the joy of learning by facilitating their need for independence, order, movement, language and understanding of the world. Through the support and guidance of a facilitator, parents will increase their awareness of their child’s capabilities and need for independence. Parents will grow in their role as nurturing caregivers as they gain valuable parenting knowledge about Montessori principles including what experiences they can offer their child the home environment. Dates: Saturdays, from 20 October to 15 December. Venue: 3 Moorina Avenue, Matraville.